I like to use birthdays as an excuse to make a new cake. Or make an tried and true cake that challenges my decorating abilities. Thus, the Tiara Cake came to be. 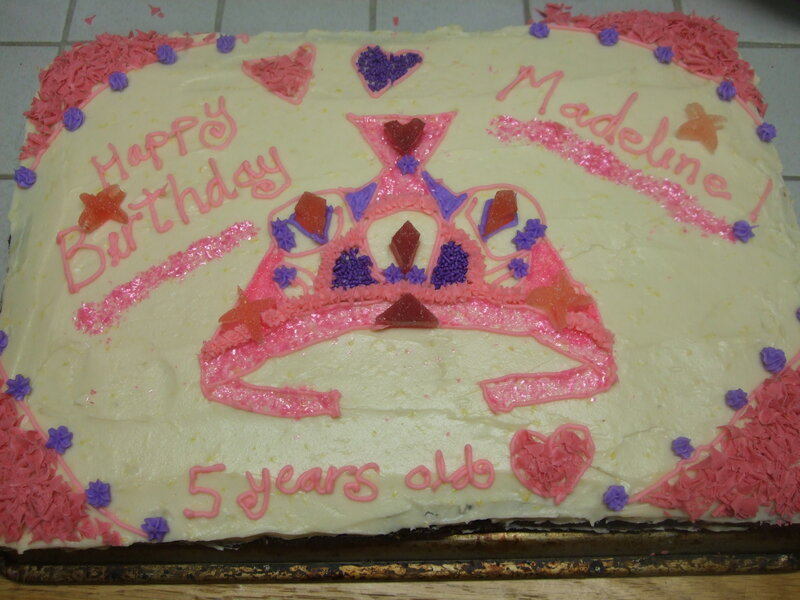 It’s in honor of M’s 5th birthday, which is today. Having a child turn 5 is one of those milestones, where you say to yourself, “Five years have already passed! I can’t believe it’s already been 5 years.” And 5 is big, because your child is playing iphone games, has decided to be an astronaut, and uses the word awesome. You may have even seen a glimpse of the teenage years to come and the accompanying fashion and attitude, and yet, you still have a little girl who likes her princesses. 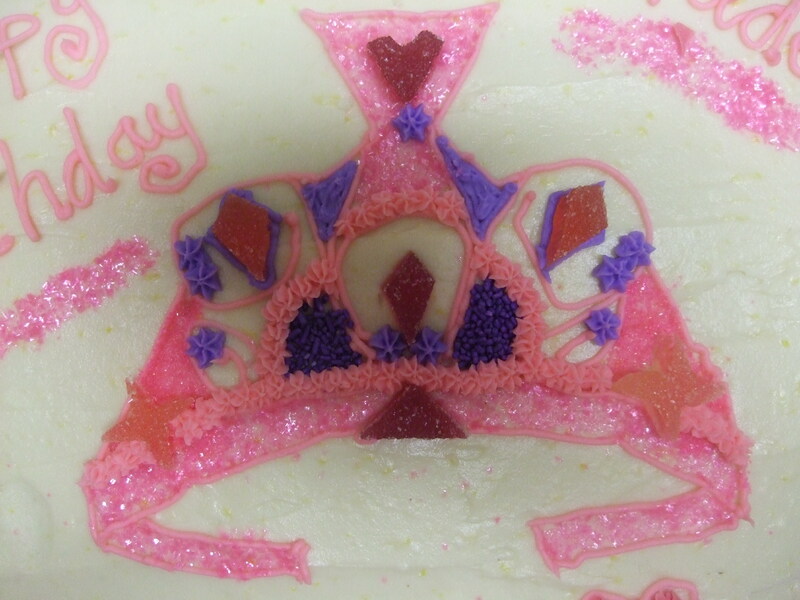 And so, in honor of the occasion (and for the party), we decided that the cake would not be shaped like a tiara itself but have a tiara (image) on it. (I wasn’t about to start drawing Ariel herself, in frosting). A tiara, which M will likely be wearing today, seems a solid symbol of both princesshood and birthdayness, and it’s not too complicated to represent in sugar products. It had to pink, of course, although I started out thinking it would be silver, only to find that frosting doesn’t come in silver, not at any local store anyway. M had also requested that I write, I love you and put some hearts on the cake. For her party, we are also having a pinata, which has all six princesses (I guess Repunzel hasn’t made it into the hallowed center six for good yet) hanging out at their castle. I am expecting that by next year the princess interest will have waned, and we’ll be onto something else. I think we’ll be ready. The cake is devil’s food cake with white chocolate chunks (again, for surprise) and a cream cheese lemon frosting. I mix up the first two in the kitchen aid, add the second two, sift in the sugar. Mix but not too much. And it keeps in the fridge for week.